Full disclosure: I don’t bake. I made a cake once. Once. It had a slope vaguely reminiscent of Bob Hope’s profile. I had to buy little plastic trees and skiers to make it look intentional. Most of the time, I buy dessert — what the English call “pudding.” Which brings up the subject of this post. “Dessert” for me is a cheese course. And therein lies the confusion for some. How does one cut oneself a serving? First of all, feel free to take a sample of each. But do so by cutting thin wedges from the larger wedge of cheese — a brie or Camembert for example. That leaves an …err… appetizing portion left for the next guest. And be sure to take some of the rind (unless it is wax or paper covered or something.) It is usually very tasty. If faced with a rindless block of cheese (perhaps a cheddar) you may slice straight across. If faced with more than one choice, please use the knife associated with each. That way you don’t wind up with extraneous Bleu d’Auvergne tastes in your fresh goat cheese. And neither does the next guy. Transfer the slice to your cracker using the knife and eat the cracker with your fingers. If you are being served at table, you may put a serving of each cheese you select onto your plate and then eat using your knife and fork. 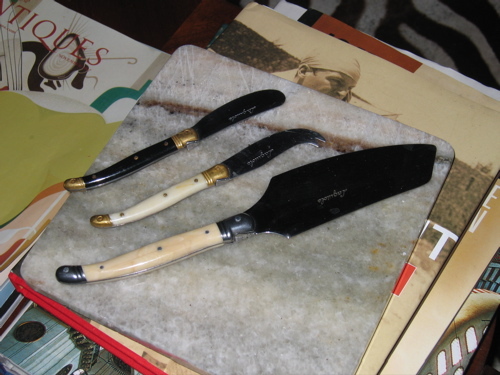 If you are given one of those specialty cheese knives with the forked end, the right way to use it is to cut the cheese using the center of the blade, turn the knife and spear the piece with the tines and eat directly from the knife. I doubt that you will ever be faced with having to do this. And for the record, the port is placed before the host, who serves the guest at his right, then himself and passes the port to the left. The bottle is passed until the port returns to the head of the table. Do not forget to pass the port. How perfect…to see Gerald Murphy peeking out from under your marble cheese square in the photo! Thank you Nell E. He and Sara were among the best practioners of living well. They continue to inspire. I just got a nice cheddar with figs and orange from Trader Joe’s. The week before, it was a stilton with apricots. YUM!